I love a full neckline. Even in a mini size. And I just love raw edges with knits. It adds the perfect amount of shabby. And I also keep working with tone on tone.….. Yum. And this top makes me long for spring. And either re-purpose an old shirt……or find some clearanced knit. I found this yellow knit for $2 a yard at hancock fabric. Nice and affordable for a new shirt. 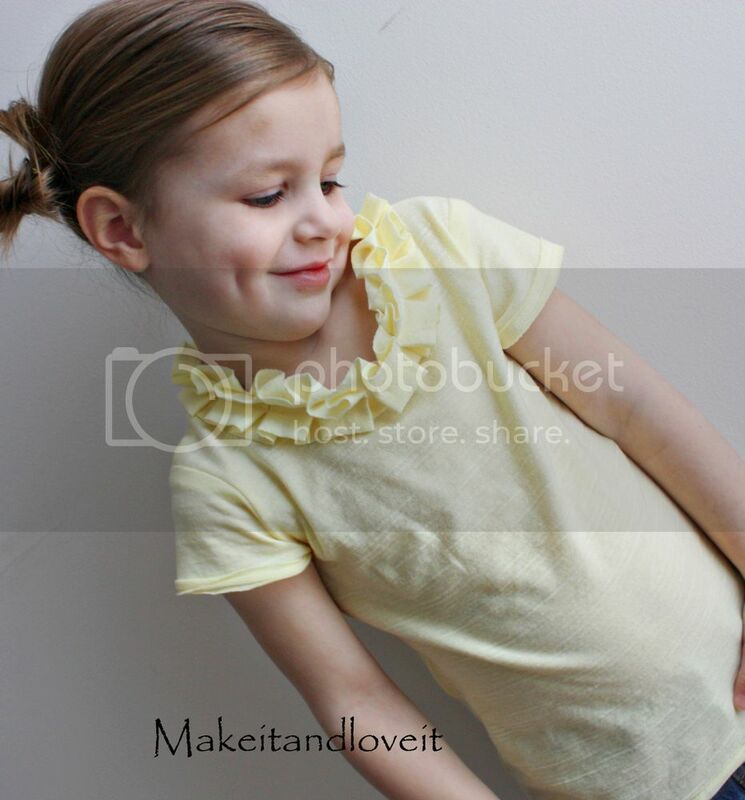 First, make a basic shirt using an old shirt just like the tutorial here. Or follow the technique used here. Both will get the same results, it just depends on how you like to piece your sleeves onto your shirt. However, don’t finish off the neckline, sleeves, or bottom hem. Leave them alone for now. First, make your pleated neckline by cutting out a long strip of knit. My daughter wears a 3T/4T and I cut out a piece that was 1 1/2 inches wide by about 60 inches. I pieced 2 pieces together to get it that long. Adjust according to the size you’re making. Then I started making pleats in the strip of knit and pinning each pleat in place. I folded two folds in toward each other…..
And then did the same going the other way…… Over and over again. Each pleat is folded over about 1/2 an inch. I made this pleated section long enough to go around the entire neckline. I placed the pleated strip about 3/8 of an inch above the actual neckline of the shirt and sewed down the center of the pleated strip. This will assure that you catch the neckline underneath in your stitch, as you’re stitching down the center of the pleated strip. I started at one end in the back, starting with a flat tail of your pleated section. I sewed all the way around to the front until I got the the back again, about an inch or two from the end. (Make sure that the shirt underneath is lined up properly and is laying flat as you’re sewing.) I cut the excess fabric off……..
……..and made sure that the loose end was tucked under before sewing the rest of the way around. Then I made another seam right above the first one, making sure to catch the neck line of the shirt again. Now you can either hem the shirt sleeves under, or you can cut about 1/4 inch off the end…..
…….and pin it right to the edge of the sleeve. Then sew all the way around. That gives it kind of a shabby, raw look to it. Do the same with the bottom of the shirt. **By the way, I was talking to my mom (my original sewing instructor……bless her for her patience!) and I was asking her what other easy tricks she knew for sewing with knits. She was telling me about a crooked zig-zag, that looked like a lightening bolt. I looked on my machine, and sure enough. There it was. It sews like a zig-zag, but more diagonally, and all squished together. I know that sounds crazy, but it sews in more of a straight line but there’s a zig-zag to it, so it allows the knit to stretch. Try it out. That's so beautiful! I really love it! can't wait to try this for my munchkin and myself. and your little model is beautiful! Of course, that is a great way to finish off the sleeves! I always use cheap long-sleeved tees for my tee refashions, and it is really hard to hem a knit; the feed dogs stretch it out and make it look pretty awful. I will try that next time! Oh i love this project! I have a shirt for myself that has the same neckline. Its my favorit shirt! I dont have any daughters but plan to make one for myself. I think people are getting tired of seeing me in the same shirt (I wear it all the time!) and a change of color would be good! As someone who wore clothes my mom made me growing up (which definitely wasn't "in" when I was a kid) I sure wish you would have been my mom. 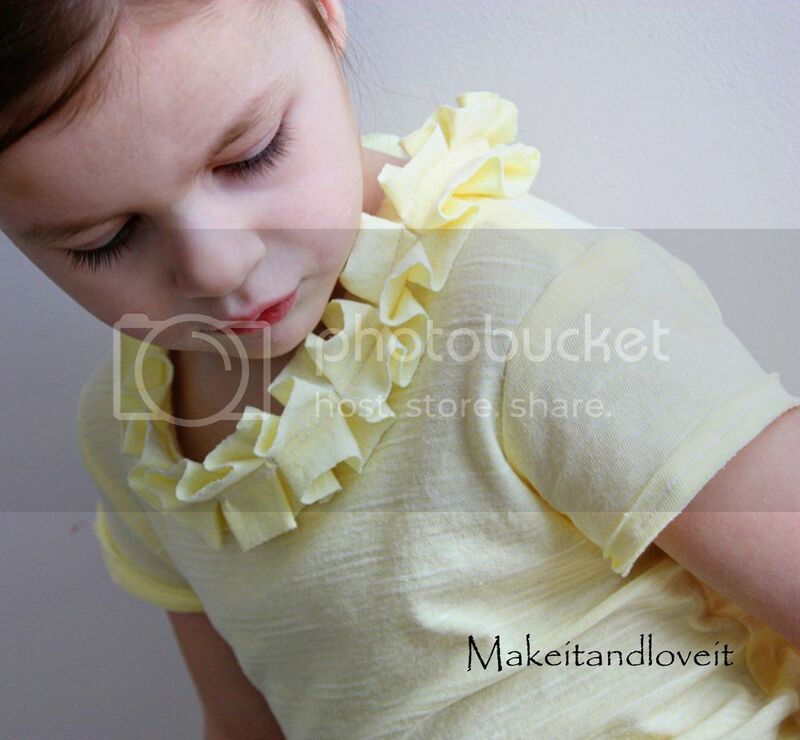 The clothes you make your kiddo's are so darling and stylish!!! I would have loved that. Now that I think of it… that type of ruffle would also look gorgeous around the base of a lamp shade as an accent. It looks stunning around the neckline too! So cute! I love the idea of the raw edges. I was reading the post thinking, I'm totally going to do that to all my knit shirts. Then I thought, but my stitches always break because the shirt stretches when I pull it on, so never mind, I'm totally NOT going to do that to all my knit shirts. But THEN i saw your note about the lightning bolt stitch! I always wondered what the heck that was for! THANK YOU! That is such a sweet and simple tutorial! I am totally going to try it this weekend for my daughter (and maybe myself)… thanks a bunch! This is so pretty. It's time to dust off my sewing machine. I don't have a girl (just boys)..but, I'm going to try this shirt. TOO CUTE! Add a mark beside your name…you have a NEW blog stalker! I just started following your blog and love your work. Honestly I need some sewing lessons from you. You are amazing. I am going to have to try this out on my little girls and I might just make one for myself! Oh My Gosh!!!! I just found you. My family is getting nothing but sandwiches for supper because I'm spending the afternoon HERE!!! That is super adorable! I wonder how it would look on my son… just kidding :)… but I could make it for a friend! One of these days I'm going to get up the nerve to try sewing a shirt. Seems so daunting. But your tutorial from awhile back makes it look surprisingly easy. And with all your tips from this post I'm moving it higher on my list of To Dos. I have a t-shirt cut out ready to go, I am going to try this to fancy it up a bit, looks great! and thanks for the zig-zag tip, I have that on my machine but never knew what it was for – my manual is all in Japanese! 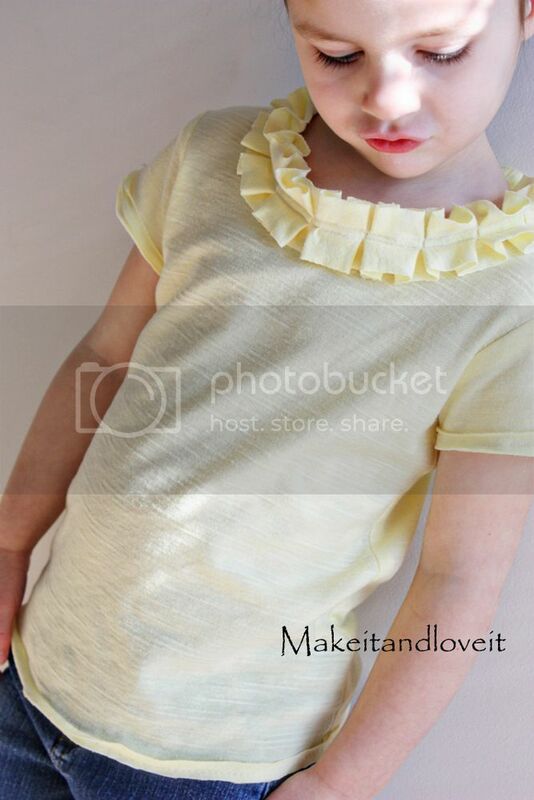 I have made a few dress tops out of cotton like this for some people and I love the look of it! If you make a tube and do the same thing it makes it look a bit more finished. But I also like the shab look. Very cute! Love it! I want one for me! That is adorable! One of these days, when I get brave, I'll give that one a try, thanks for sharing! I LOVE IT! So springy and girly, and of course the fact that it's uber easy makes me love it even more! This is adorable! I want it to be spring. Thanks for the stitch tip! love this shirt! now I've GOT to find some girls to make girly things for! I have two nieces, so maybe I'll just have to wait a few years…hmm. Love it! Adorable shirt, thanks for the tutorial! OH I LOVE IT! I WANT ONE! I've missed your clothing tuts. Love the shirt! You are wonderful! Love the tutorial! I know you are a busy lady, but I awarded you on my blog! I wish I was that talented. I can't sew to save my life. I did do a re-decorating project, you can see it over on my blog. If you like it I thought maybe I could guess blog for you. Let me know. I've been following for a while and you have gotten me super motivated with the creative juices flowing. I have a non-crafty question tho. What kind of camera do you use? I am always admiring how your pics came out. We just got a canon 50d and I cant seem to get the settings tweaked just so. Any tips? So cute! I'm excited to try it for my little girls! When you wash the knits, it fluffs the edges a teeny bit…..but most knits won't unravel at all. I have left several of my homeade shirts with raw edges and they still look great. But everyone's preference is different. I made a dress out of regular 'ol lightweight cotton the other day and added a similar ruffle around the neckline……but for this I made a tube of fabric first, turned it right side out, pressed it, and then ruffled it up. Just as cute…..just takes a bit longer. I bought some knit fabric recently but I am sooo afraid to use it. This could be a good way to start. Thank you for this lovely tutorial – again! That tutorial is awesome! I have been looking for one for ever it seems! Thanks so much! Your project came out awesome! I want to make one for me, this is gorgeous! Thanks so much for explaining it so well. I'll be linking. This is soo cute! My daughters would love one! I am thinking of making one! Thank you so much! This idea is fantastic, i like your blog. I LOVE THIS!!! You always come up with the cutest things. I'm going to do a little repurposing this weekend for my girlies and all my inspiration came from you. Thanks! I am absolutely loving this shirt! The colour is that perfect spring day yellow! I've got some tshirt dresses I'm making that would look adorable with that collar…thank you so mch for the inspiration! Thank you for this idea. I was trying to make the ruffle front shirt out of a non-rib knit and the neckline was a mess! I was going to scrap it, but this neckline has saved it. it's still a little stretched out, but looks so much better. I'm still having a hard time with stretching. Can you post a picture of the lightening stitch? I have a few that might be the one you're talking about. Thanks for all the fun projects! 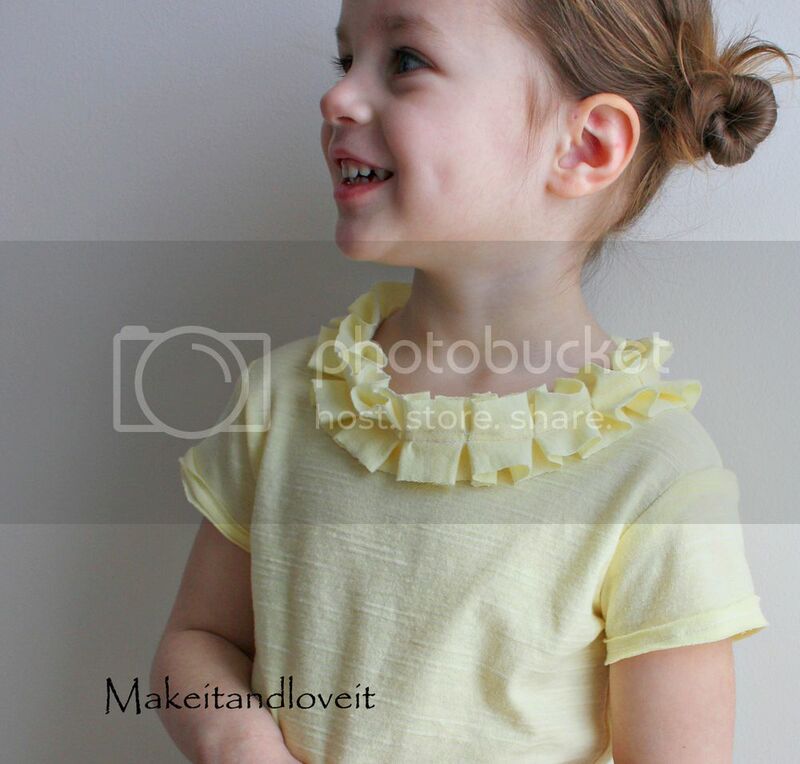 i was just looking at some shirts like this at crew cuts (jcrew kids), and thinking about how jane would love one. ruffles are everywhere this year, and i'm excited to try making these. I LOVE this shirt! I totally want one for myself and my little girl! Thank you for such amazing instructions and ideas!! Your daughter is just darling. I made one for myself today. Thanks for the great idea! I love this tutorial too. I think I am going to try this out on one of my t-shirts I have in my closet for myself. I am always up for a refashion in my wardrobe. Thanks.